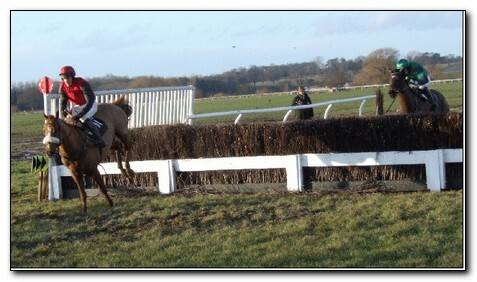 It was good to get our new season under way in the North West with the Albrighton meeting at Bangor on Dee. The recent deluge of rain meant that the ground was heavy, the modest crowd were treated to an excellent days racing and with 8 races on the card there was plenty of action to enjoy. 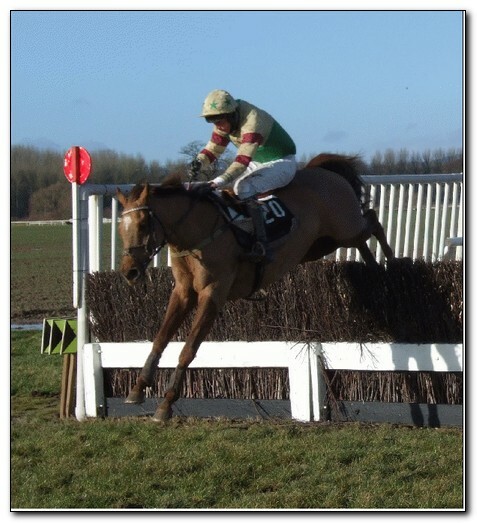 The Cherry Coward trained Amicelli, the winner of the Cheltenham Foxhunters at the Festival in 2008, made a very impressive seasonal reappearance in Men’s Open under Oliver Greenall, winning on the bit by 8 lengths from King Killone with Adams Wine a distance back in third. 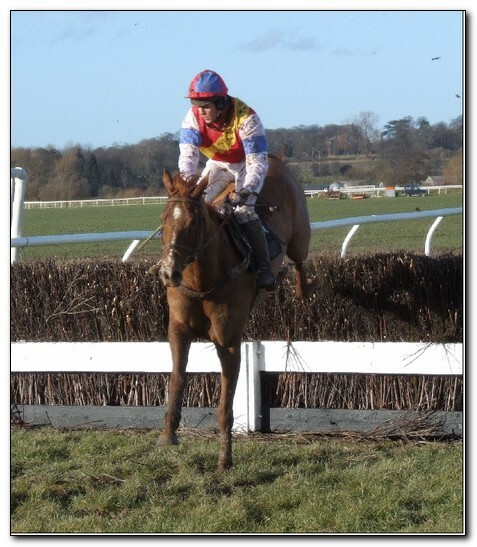 The winner is owned by Lord Daresbury, who as Peter Greenall rode plenty of winners between the flags and under rules. Speaking after the race , he said, "When I bought him off Phillip Hobbs he told me to never run him on soft ground and its very testing out there, but he has handled it well. He will have one more race before having another crack at the Cheltenham Festival." 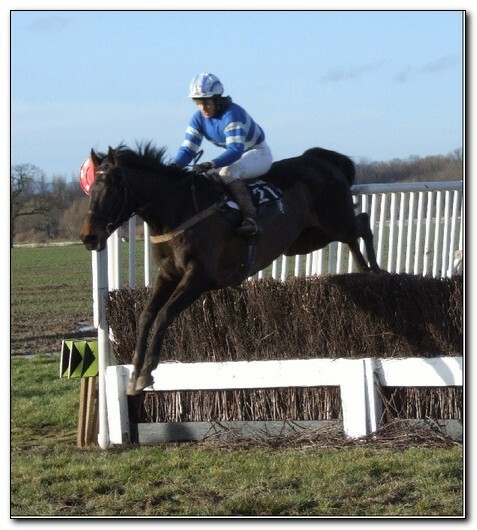 Sixteen year old Alice Walker, who is taking her A levels at Shrewsbury school, made a little bit of history yesterday when she followed in the family tradition by winning on her first ride in a point to point. Her grandmother Sheila Crow won at 16 on Venlus, her mother Lucy Walker also did this at 16 on Adulation. Little Big Horse, who runs in Paul Dixon’s colours, looked beaten when Hoh Nelson under Ben Poste jumped the last with a lead of 3 lengths, but Little Big Horse under Alice Walker landed running and got up in a driving finish to get up in the very last stride to win by a neck from the fast finishing Absolutely Barking with Hoh Nelson three parts of a length back in third. The winner is trained by her grandmother Sheila Crow, who was elated when I spoke to her afterwards, she said ,"I am really thrilled for Alice, she gave the horse a great ride and it is good to have a horse like this in the yard as he acts on fast and heavy ground." Sheila Crow went on to complete a double in the first division of the Maiden with Farmer Gunner who won very easily by 8 lengths from the well backed jolly Wantage Road with Tudor Lace a further 20 lengths back in third. The winner is owned by her son Alistair who also bred the horse. Sheila Crow thinks a lot of Farmer Gunner, speaking after the race, she said, "He is related to the Welsh Grand National winner Riverside Boy so the ground was perfect for him today. I have always thought he was a good horse, he will improve a lot from this race and will progress further." The former national champion lady rider Claire Allen took the riding honours with a treble at the North Wales course. The first leg came in the opening Members race with Bravery Scotch in the well known colours of Michael Parr, the Gothland gelding finished tired but still had plenty in hand to hold the renewed challenge of Glidewell by 4 lengths. 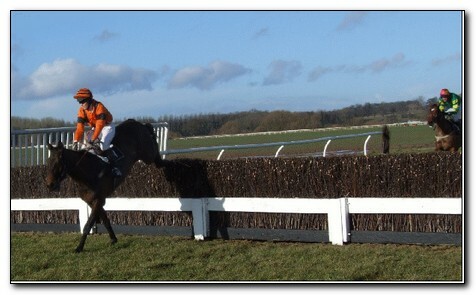 The winner is trained by Sue Taylor at Wolverhampton and the runner up is owned and trained by Neale Dalton, the chairman of the Albrighton Hunt. The third horse, eighteen year old Jemaro, finished a distance in third. 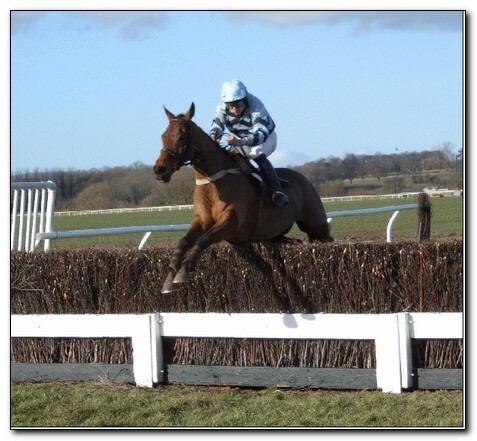 The old boy is a credit to his trainer Caroline Robinson, watching him jump the last with his ears pricked and enjoying himself is what point to pointing is all about, it is no wonder he is such a favourite with the public. The second leg came aboard Mad Victor in the Ladies Open, who is another improving inmate from the Sue Taylor yard, Allen only had to push her mount out to win easing down by 12 lengths from Flashy Boy with Henry’s Pride a similar distance back in third. Sue Taylor’s partner Paul Jones who trains under rules said afterwards that the winner was vastly improved from last year and added that he was only a little horse who is a super jumper. Oopsmylord rounded off a good afternoon for Claire Allen when winning the Restricted readily by 12 lengths from the running on Gunner Be Quick with The Tinkerater a further three parts of a length back in third. The winner is trained at Shobdan by Steve Flook who bought the horse unraced at the Ascot sales two years ago for owner Sally Vaughan. 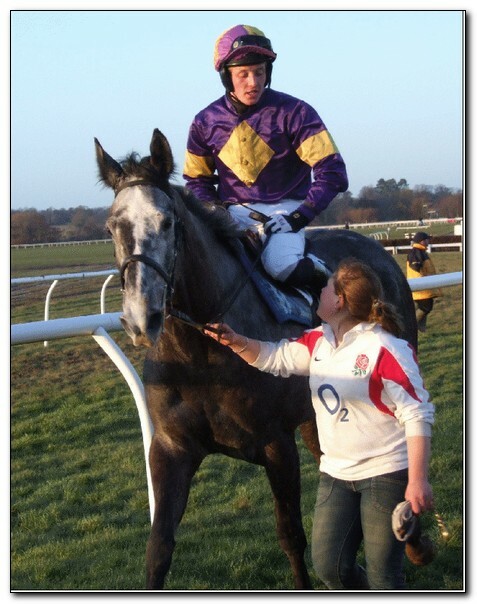 Flook became the third trainer at Bangor on Dee to complete a double on the card after Rumbury Grey ran out a very fortuitous winner under Paul Tolman of the second division of the Open Maiden, he beat the only other finisher Victory Parade by a distance. There is little doubt in my mind that if Impact Zone under Tom Greenall had not fallen at the last when upsides he would have won easily. Winning owner Christine Rogers bred the winner herself. One trainer who did not mind the testing conditions was Leominster trainer Sarah Jayne Davies as her charge Turn Card reveled in the conditions under Jonathan Jarrett in the two and a half mile Maiden to win easing down by 8 lengths from Nosey Gunner with the jolly Phenix Jack a distance further back in third. Davies was elated when I spoke to her afterwards. She said, "I am thrilled, he really deserved this. He has been working well at home and I thought he ran very well at Cottenham, this was his ground the heavier the better, I have always said that if meetings were almost off then that would be his ground." 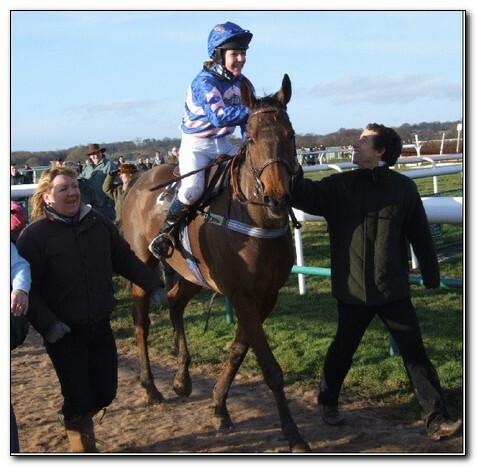 The Docksider gelding is owned by Ms Helen Wood from Ludlow who bought the horse last year from the trainer.